Holocaust Survivors: Photo Gallery - "Picnic"
It is traditional to go on a picnic in the country to celebrate the holiday of Lag B'Omer. Lag B'Omer occurs in the spring and in part is the commemoration of the lifting of a plague. 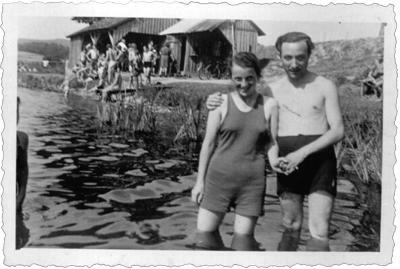 In 1947, Joseph and Rachel were living in a Displaced Person's camp in Germany with other Jewish survivors in the little town of Neunburg vorm Wald which is near Regensburg. The Shers were happily married for 56 years. Rachel died in 1997.